Kawamono: Kawamono Innovation 2017 ! 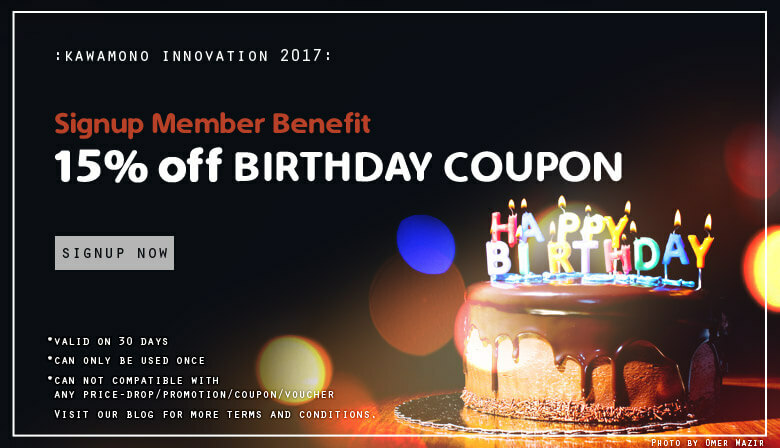 Sigup Member Benefit : Enjoy the 15% off Birthday Coupon / Voucher. Kawamono Innovation 2017 ! Sigup Member Benefit : Enjoy the 15% off Birthday Coupon / Voucher. No minimum purchase is required to use this Coupon. To redeem your Coupon, please enter the corresponding Coupon Code in the "Voucher" field during the checkout process. The Coupon is applicable towards product prices only, and cannot be applied to shipping or reshipping charges. The Coupon is non-transferable and may not be redeemed for cash.